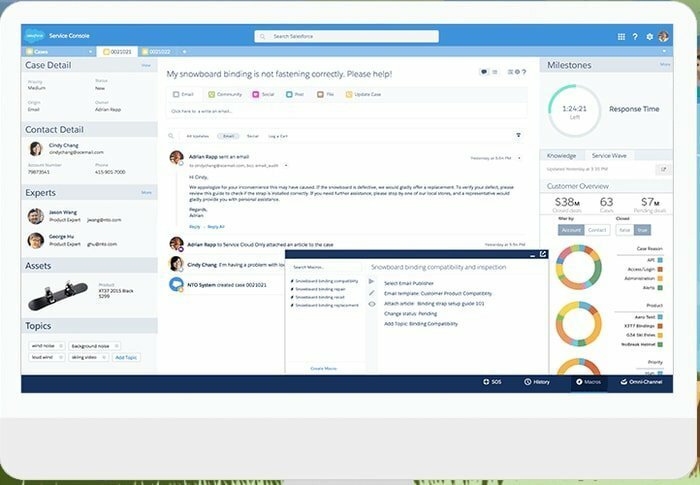 What are the Products Salesforce Have? 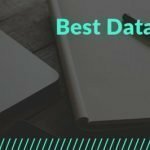 Why is Salesforce Best Cloud App? Why will You Use Salesforce? Salesforce Cloud CRM review is nothing but to help you to pick up the right decision to find Best cloud-based CRM Software. Salesforce Cloud CRM will give the idea to invest in customer relationship management software. It is one of the best cloud-based CRM software. 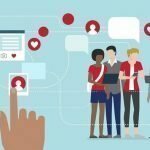 Customer relationship management is the strategy of leveraging customer data, their engagement with the purchase, sales, marketing, transaction analysis, and even production management. The main purpose of CRM is to retain the customer and provide the best support. There are lots of cloud CRM service providers. Salesforce is one of the Best cloud-based CRM Software among them. Salesforce.com, Inc. writes in its logo as salesƒorce. It is so popular that people use its abbreviation as SF or SFDC. Basically, it is a San Francisco, California based US cloud computing company. This company has both CRM and social networking business. Salesforce is one of the best Fortune 100 company in the year 2018. Salesforce is one of the pioneers of the CRM movement. It was started its journey in 1999. Now it is the industry leader in on-demand service. Former Oracle executive Marc Benioff, Parker Harris, Dave Moellenhoff, and Frank Dominguez founded this company. It is very special for its software as a service (SaaS). Service Cloud serves customer everywhere with the service platform. This cloud allows agents on the path to customer success with faster, smarter service tools. It has AI and automated result. Salesforce builds self-service communities. It will give your clienteles entree to the answers they want to solve problems. Salesforce is number #1 marketing business intelligence. It is not just a CRM platform. Salesforce collects all the customer data in a single platform. It provides a more complete understanding of the attitude of your customer to drive more business. Commerce cloud salesforce creates personalized cloud based on shopper’s choice. It delivers an excellent shopping experience to all channels. 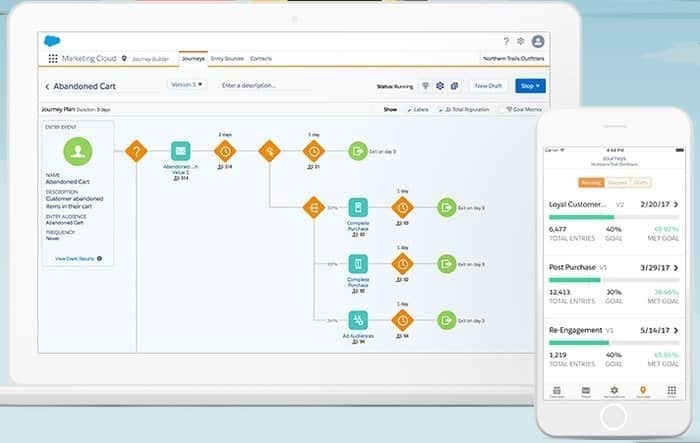 Salesforces move to market faster and connect customer quicker. It Conquers personalization and Speeds up your operations. It is number #1 B2B cloud CRM in the world. 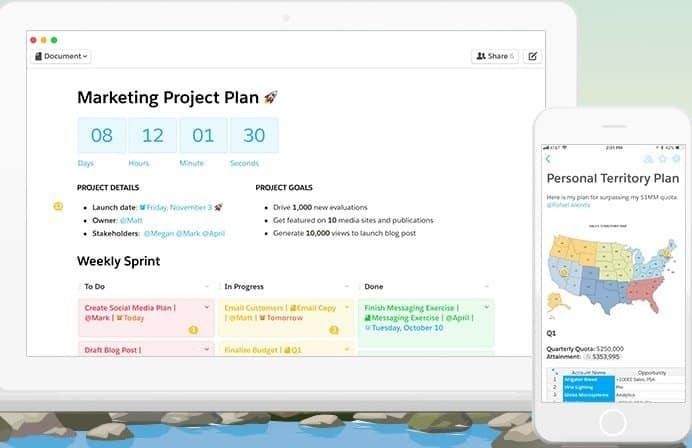 Quip salesforce is a cloud collaboration platform. It discusses, creates and does faster work than any platform. Quip connect relevant document and communication. It is easy to customize the workflow by quip. Salesforce is the number #1 CRM app of the world. It extends and customizes your CRM solution with myLightning. Engage each and every employee by its to customize cloud app. It builds security trust with amazing customer experience. Salesforce cloud-based CRM software allows the user to synchronize contacts, calendar, emails, and tasks. Ensure fast communication among the team. Optimum software for sales monitoring, progress, and closure. Easy to generate the report. Salesforce is a PaaS. Platform as a service of PaaS provide opportunities for the development platform. Since Salesforce provides the platform to its user, then it is a PaaS. Salesforce is the more customizable platform. So it has all the features of a platform as a service. IaaS or infrastructure as a service is the opportunities of using the infrastructure facilities without purchasing the real infrastructure. Salesforce is a cloud-based customer relationship management software. The cloud app software self-has an infrastructure. The customer gets access and gets the facilities for both software and backend hardware. So we can be called it IaaS. Actually, Salesforce is a software as a service or SaaS. In SaaS all the product is readymade. In Salesforce is have the same business. Salesforce provides world best cloud-based customer relationship management software with amazing reporting tools. It provides business intelligence of BI tools. In private cloud service, the infrastructure is operated or deployed exclusively for an enterprise or organization. It can be managed by that organization or by an independent third party. On the other hand, public cloud service is pure business. All the other cloud user use the public cloud. Since Salesforce is selling its service to over the world, so it is a public cloud, it has on-demand or pays as you go service. Salesforce is the best cloud app because of its unique feature and capability. 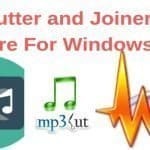 It is highly customizable and connects thousands of business cloud app. Its price is so friendly that any small and medium organization can deploy salesforce cloud app. Moreover, Salesforce is easy to set up and easy to use. Out-of-the-box CRM for up to 5 users by $25 per month, Complete CRM for any size team by $75 per month. Its most popular product is Lightning Enterprise by $150 per month. Finally, the product Lightning Unlimited is only for $300 user per month. 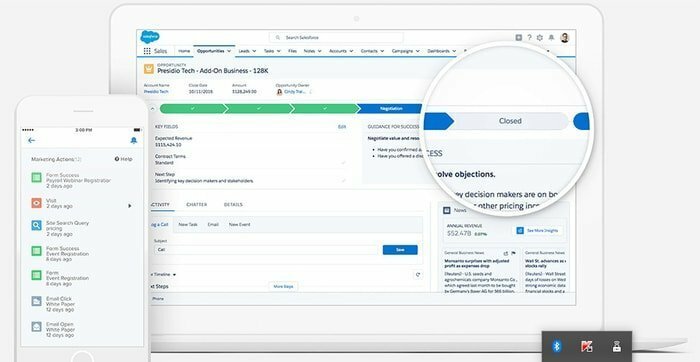 In the Salesforce Cloud CRM review, you already find why you will use Salesforce. No doubt it is one of the best cloud-based CRM. However, Salesforce Cloud CRM review will give you the proper idea of cloud-based CRM software. Though Salesforce is the world best cloud-based customer relationship management software; they have many competitors of Salesforce. Some competitors are Zoho, infusionsoft, amoCRM, HubSpot, NetSuite, Free agent, base CRM, shape CRM, Chime, act CRM, pipeliner, Apptivo, Firepoint, loadmaster. Some other cloud-based special CRM are the BNTouch mortgage, property base, bpm online CRM, Clearitysoft, FunnelMaker, etc. The writer did not write the article of Salesforce Cloud CRM Review based on his own uses. He studied the use of Best Cloud-Based CRM Software and wrote the Salesforce Cloud CRM Review. As with any small and medium business organization, you may use Cloud-Based CRM Software. So this Salesforce Cloud CRM Review will help you a lot to take the right decision. Remember the more you invest in technology, the more you will get the return from business. However, you can comment on the Salesforce Cloud CRM Review.